The kids will love camping in this Salem Cruise Lite travel trailer thanks to the double bunk beds they can climb into each night. 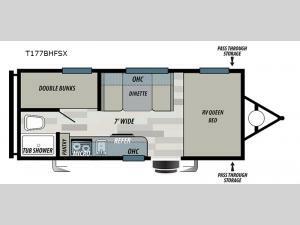 There is a comfortable RV queen bed up front and a dinette, which allows this unit to sleep seven every night. The chef of the family can prepare breakfast on the two burner cooktop, and there is plenty of counter space to cut up some fruit. This unit includes a rear corner bath with a toilet and a tub/shower to clean up after a day at the lake. The Forest River Salem Cruise Lite West coast models feature an aerodynamic front profile, a radius entry door, and an awning to shade you during the day. Inside, the 78" ceilings allow you to stand up and move around freely and the decorative molding and two tone wood grains give these units that comfortable feeling of being at home. These models also include two exterior speakers, a digital TV antenna with booster, plus E-Z lube axles with radial tires which makes towing them easier than ever.